Your daughter can look just like a vintage handcrafted toy in this Sock Monkey Costume For Girls! The polyester interlock knit dress is printed in tan and cream to match a fabric sock monkey body, complete with a red stretch velvet collar and a band of cream colored velour in front at the waist. A separate tail attaches to the back of the dress with Velcro™. The tutu petticoat of glittery red poly knit mesh is worn under the short, gathered skirt for extra volume. A pair of soft, cream colored velour leg warmers and matching glovettes are included too. Top off the look with the sock monkey cap that has a friendly sock monkey face sewn onto it. 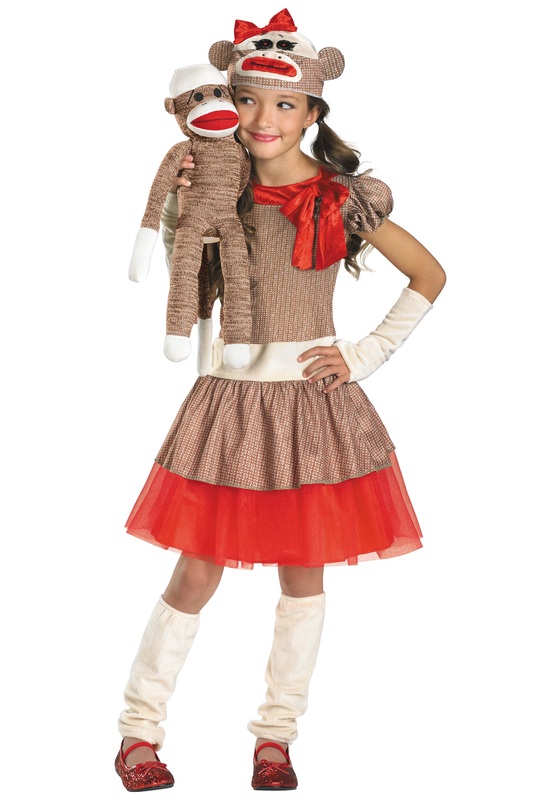 We have sock monkey costumes to fit the whole family--check them out!